Bottale is a 19th century Casa Colonica which was originally built as a working farm on which the family raised their livestock of cattle and pigs. The house is built on the side of a hill with a south facing terrace providing magnificent, uninterrupted views across the beautiful and unspoilt Carpini valley towards the medieval village of Montone. The house is set in two and half acres of natural surroundings with two formal gardens laid to lawn and planted with native and exotic plants. 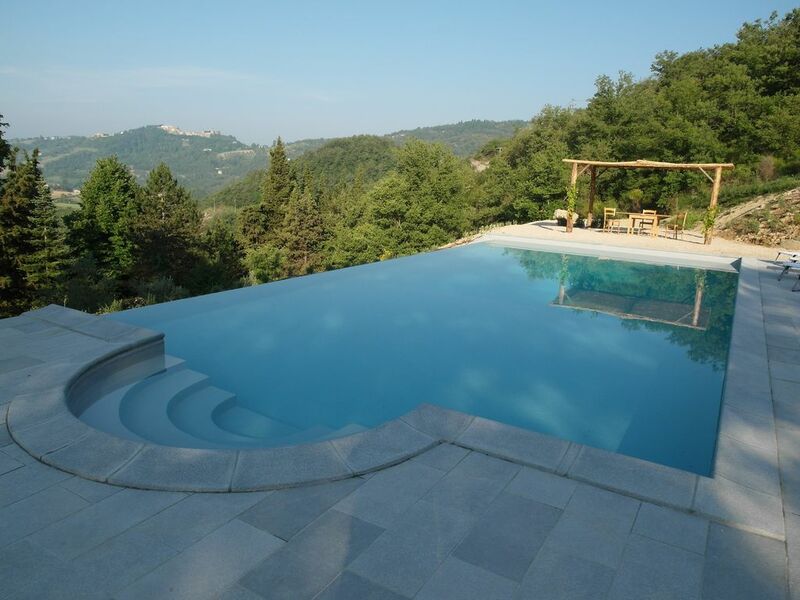 The 12 metre infinity swimming pool is situated on a terrace above the house and provides uninterrupted views across the Carpini Valley to Montone. Internally, the house has been renovated to a very high standard an offers excellent facilities for relaxing and entertaining. Bottale provides easy access to local shops and markets as well as for sightseeing towns and cities such as Assisi, Perugia, Siena and Florence. The Adriatic coast is a 90 minute drive with Mediterranean being closer to 2.5 hours. Bathroom 1 - shower cubicle, wash basin, bidet and wc. Bathroom 2 - bath, walk in shower with overhead shower, wash basin, bidet and wc. All bed linens are provided and are changed weekly. There is ample car parking space with room for several vehicles. Lounge with traditional fireplace and wood burning stove. Two sofas, TV and DVD. (The TV is not linked to an aerial or satellite so it is only possible to watch DVDs - wide selection provided). A welcome pack is provided . Very spacious, fully equipped kitchen with central island: electric oven, gas hob, dish washer, fridge/freezer, wine chiller, wood burning stove, kettle, espresso machine, toaster etc. The television is used to watch DVDs only, i.e. there is no aerial or satellite connection. The 'stereo' is an iPod dock and mp3 player. Notes on accommodation: Permanent WiFi Internet access is provided. Outside: Bottale is set in 2.5 acres of terraced gardens. The infinity pool is situated on the uppermost, south facing terrace and is bathed in sunshine for approximately 12 hours a day during July and August. There are two formal areas which are lawned and planted with a mixture native and exotic plants. There are also many mature trees including cypress, olive, walnut, cherry and maple. Moving away from the house the land is allowed to grow more naturally to encourage and support as much of the varied indigenous wildlife as possible. The south facing sun terrace offers magnificent, uninterrupted views across the Carpini valley towards the medieval village of Montone. The terrace is accessed from the kitchen and is equipped with dining table and umbrella for alfresco dining. These are complimented with loungers and a barbecue. Utility Room: Large room: Miele washing machine and tumble drier. Iron and ironing board. Double sink. Cleaning / Towels / Linen / Maid service: Fresh towels, including pool towels, and linen are provided (changed weekly). Other: Galleried reading room. Wifi internet access. Fabulous house in stunning location. I asked the owner questions before booking and got very honest replies. Downsides are height difference between parking space and the house makes taking luggage in hard work and the road (which has very light through traffic on it, used a lot by cycling clubs at weekends) which is close to but below the house. The passing traffic sometimes distracts on the terrace, but does not generally affect guests. Upsides are the fabulous views, the large well equipped attractive house, with terrific outside eating arrangements, and the lovely pool with a view. Having Eva as house manager, for whom nothing reasonable is too much trouble, is very reassuring. There is fabulous walking in the area, it is even possible to walk into Montone on footpaths and very quiet roads from the house, for lunch in Montone’s excellent restaurants. Some paths from the house are a bit overgrown but if there is a bit of an explorer in you and you download the maps, it is a good walk. So whether you want to laze by the pool, explore locally on foot, or a base for visiting the beautiful towns of Umbria it is a great location. Lovely countryside house with a great view of Montone and surroundings. Great cool pool in the heat. Perfect house situated with only 1-2 hour drives to all the perfect medieval towns in Umbria, whilst offering warm and lively towns by the doorstep. The house lies by the road for daily commuters between surrounding towns, but can only be noticed at regular traffic hours. We loved the house. Very well appointed. Excellent location. Owner knows what he is doing as a host and everything has been thought out for guests. This is huge. The location is ideal. The pool perfect. The kitchen well appointed. Beds comfortable. Grounds well maintained. View amazing. And the local bakery in Montone rocks. Highly recommended for all of the above. The house does sit next to a country road so there is the occasional sound of a car or farm vehicle. Lovely relaxing week for the family in Umbria. Perfect accommodation with amazing views of the nearby town of Montone. Would love to come back! The nearest beach is at Lake Trasimeno, approximately one hour's drive away. One of the most beautiful seasidebeaches is at Sirolo, on the Adriatic coast, south of Ancona, which is a 2 hour drive. The Mediterranean coast is a little further at (2.5 hours). The nearest airport is Perugia (30 minutes) to which Ryanair have regular flights from Stansted. There are also airports at Forli (90 minutes), Ancona (2 hours), Bologna (2.5 hours), Pisa (2.5 hours) and Rome (2.5 hours). As well as the local villages, where you will find all of your immediate needs, Bottale is well placed to explore some of the more famous towns and cities such as Perugia (45 minutes), Sienna (2 hours), Florence (2 hours), Rome (2.5 hours), Gubbio (1 hour), Urbino (1.5 hours). Montone, awarded one of the most beautiful villages in Italy, is approximately 5km from the house and offers a very good selection of highly recommended restaurants, including Del Verziere, Erba Luna and Locanda del Capitano. It also has two delightful bars situated on the piazza together with several local shops (two grocers, a bakery and a delicatessen offering a range of good local produce). There is also a bank with cashpoint, post office, chemist, doctor and dentist. Umbertide is the nearest large town which has several supermarkets as well as its own restaurants and bars. Each Wednesday morning there is a market where you will find a wide variety of local produce including, vegetables, meats, cheeses and olives. The region is renowned for its natural beauty and, although July and August are the hottest months, we would encourage prospective clients to consider May, June and September when the local fauna and flora are at there most resplendent. Booking Notes: Please telephone or email to check availability. A 20% deposit secures your booking with the balance payable six weeks prior to your holiday. Changeover Day: We prefer Friday or Saturday but we try to be as flexible as possible.